I am now sorry that I have insufficient images to support my story, but last night Rahul and me had a really good meal in Gurgaon. We set off after putting the kids to sleep in pursuit of a small, cozy place to grab a tasty, well prepared meal. We didn’t have a preference for cuisine, but the discussion had started with finding that the biryani joint that we wanted to try happens to be close on Mondays (Biryani Blues, which I hear great reviews of from reputed food enthusiast friends, you know who you are!). So we were predisposed to Indian food, which we rarely ever eat out of the home. We decided to go to one of the local markets in DLF Phase IV where we hadn’t been for a long time. Roaming around, we chanced on Ki Hangla. It struck a chord with Rahul, who had read a review somewhere and in any case, he needs no excuse to try a new place! The lady at the door with her warm smile and quintessential Bengali look probably sealed the deal and we went on to order (trust Rahul’s excellent food instincts) and eat an excellent Mutton Chop, filled with succulent pieces of cooked mutton. 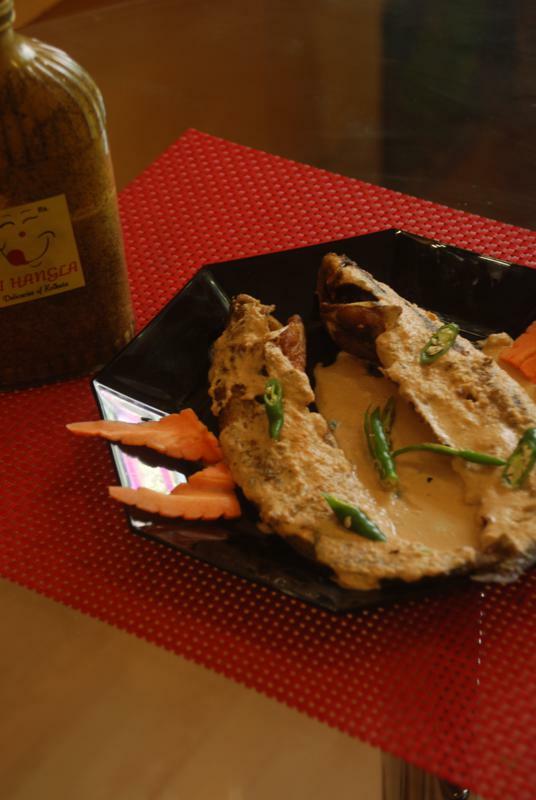 For the main course, we tried the Pabda fish cooked in mustard gravy with boiled rice. Our lady the shop owner was endearing, as she spontaneously broke into Bangla as she took our order, so totally into the flow she was! She was eager, attentive and upfront about her reccomendations. The contrast between her genteel elegant presence and the crazy dance-and-song numbers playing on the Bangla TV channel created a quirky real-world atmosphere that I quite enjoyed. If you’re awkward about conversation with someone, this is a good place to go to, you could spend the evening commenting on the strange costumes and bizarre choreography in current Bangla films! Posted on August 27, 2013, in Travel & Experiences and tagged Bengali food, eating out, food, Gurgaon. Bookmark the permalink. 6 Comments. This gives me cravings . ha! then go eat, simple enough, no? Pathaar mangsho (mutton curry) is a Sunday staple for most families and shorshe maacher jhaal (spicy mustard fish) is my other favourite. Now I need to go make some! The very young Aunty was most certainly feeding us Tina! Thanks for writing in!